Let us know what he says. One ortho i called had different rates for different services. He said $625 for him to oversee the entire crane treatment, and another amount (he didnt say) for them to just provide it along with modified retainers. yes i do mean retainers related the Cranee. they told me i could use a retainer with hooks attached to it. But yea the usually use ALF. really wanna see that phot. if your pulling image from a website then right click, copy image location, click insert image right below BOLD button, then paste image location in between prompt. 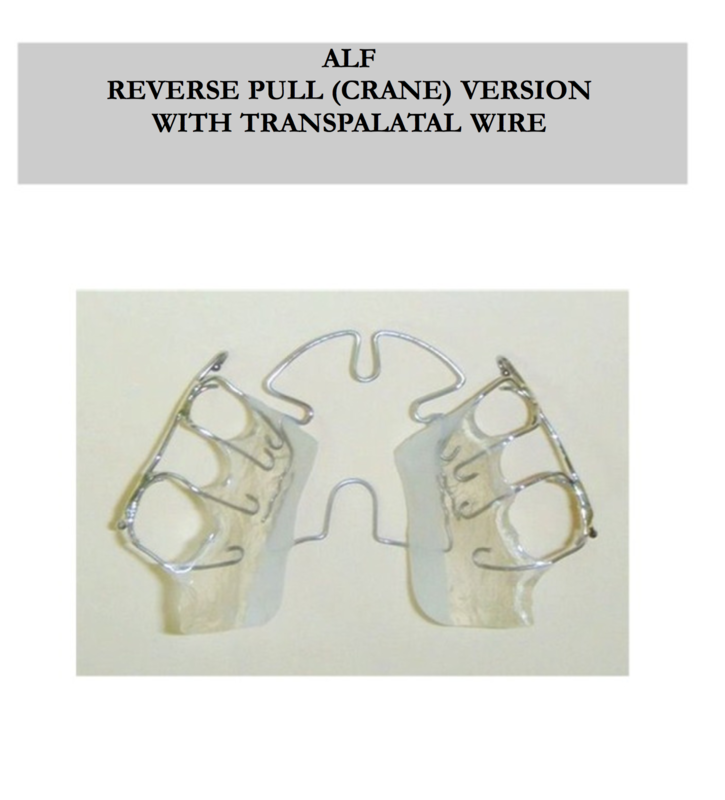 A modified retainer would be preferable, if that could be used instead of the ALF. I couldn't confirm it because there wasn't a whole lot of info, but I thought I heard that ALF requires those headgear posts (whatever the correct term is) bonded around your teeth? The Crane employee I emailed didn't reply when I asked if there's any more patient before/after photos besides X-rays, which was very disappointing considering the "years of testing" their site proclaims. Yea this is all you need for the crane. Also, strangely im not surprised there are no before and after pics. The crane needs to be worn at night and i know for a fact peoples sleep habits are poor already. The lady i talked to said one has to teach his or herself to sleep on their back for this treatment to work. for the average person who curls up into a ball at night, sleeping on their back will most likely be so uncomfortable that they say **** it and give up. Throw a crane in the mix and forget it. BUT my hypothesis is once someone fixes their head posture and can sleep on their back without ANY PILLOWS (which i have done), the crane should would perfectly. Anyone who has the crane, is this wishful thinking or does this sound practical? BUT my hypothesis is once someone fixes their head posture and can sleep on their back without ANY PILLOWS (which i have done), the crane should would perfectly. Anyone who has the crane, is this wishful thinking or does this sound practical? I agree that with correctly forward grown bone structure it should be possible, and perhaps even optimal. Do you find it easy to breathe while sleeping on your back without a pillow? I find sleep apnea and heavy snoring unavoidable when sleeping on back, even after using pillows to elevate the head and neck. It seems that even Native Americans - whose skulls neared perfection - didn't sleep without a pillow. Yet considering the evolution of the modern human it should be reasonable to assume that man spent majority of this lengthy period sleeping without a pillow, especially before becoming self-aware enough to start utilizing complex tools. All animals in the nature have their own proper growth ensuring natural sleeping positions that can be achieved without any extra props. It wouldn't make sense to believe that the modern human would've evolved to need a pillow for sleep either. Instead, it was probably something that was picked up over time to compensate for improper structure and form. Was there anything that helped you adjust to sleeping exclusively on your back, or was it just a situation of forcing yourself to do it until it was natural? I practically sleep on my face, and can see how it'd be a huge challenge to lay flat up. I find sleep apnea and heavy snoring unavoidable when sleeping on back, even after using pillows to elevate the head and neck. for those who literally cant sleep on their backs because of airways issues, continue mewing, doing oral posture exercises three times a day. We want that palate to widen and that lower jaw to come forward so that your tongue wont obstruct your airway. In the mean time you will have to elevate your upper body using a wedge pillow as that will alleviate those airway issues. This is a repeat from another thread but appropriate here. You should check the thread on handling bodies. Jaw problems are often not just the head or even in the head at all. It is much more than that. You can learn ABC™ yourself with a friend and save your body as well as time and money rather than paying someone who cannot do as much. As I state in the video, the front view is useless, it is the side view that is most important and if you go to MeningealRelease.com , sign up and learn the ABC First Rib Maneuver™ your body will work better than you imagine and you will know the rest can be accomplished consistently -- rather than empty promises that only work for some. I still have my braces atm ... I will get around to getting them off, and getting one of those funny expander things in. I am so skeptical of this before and after photo. Looks like a double jaw surgery to me. Bumping this thread because I've been obsessing about facepulling for days, specifically the Crane. What's the point of displaying someone who doesn't reflect the product being advertised? Is the blonde girl up top the same person as the blonde woman on the bottom? I thought the photos were unrelated, but the whole website looks like something from 1998 so it's hard to tell and it makes what sounds like a good invention look very amateur when presented in such a clunky manner with little information to see.